This Valentine’s Day, why not bring your romance to new heights at some of the spectacular viewpoints in Golden, Colorado? It may only be 12 miles away from Denver, but Golden feels a world away in atmosphere. 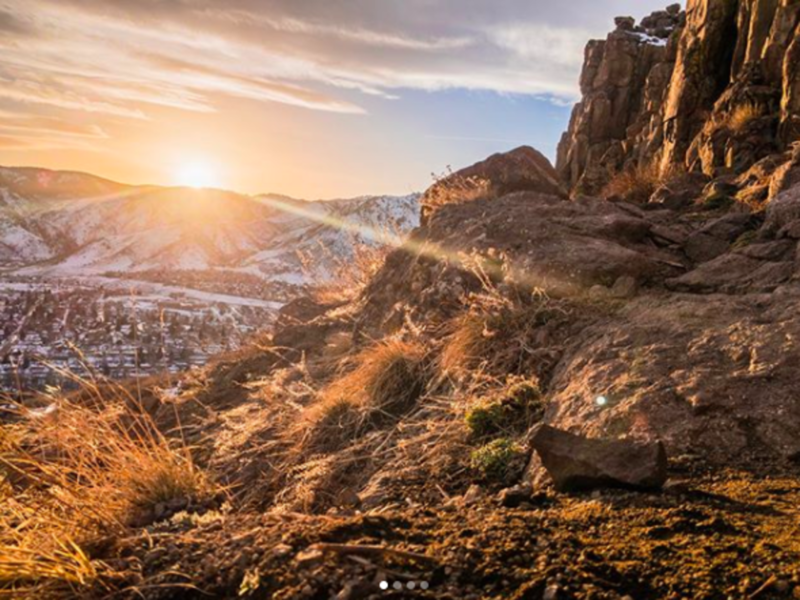 So hike, stroll, drive or climb to enjoy these Golden views and then afterwards, head to downtown Golden with your special someone to celebrate the day. 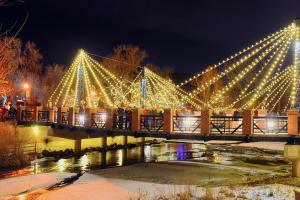 Stroll Through an Illuminated Downtown & Creek Path: This year, most of Golden’s downtown and creek side holiday lights will be illuminated through Valentine’s Day. So stroll hand-in-hand through Golden’s charming downtown and onto the Clear Creek path, where views of the icy creek are framed by the mountains in the backdrop. This wide path is easy to navigate and offers an easy loop. It’s a perfect way to walk off your Valentine’s dinner. Drive to the Windy Saddle Overview & Lookout Mountain Nature Center & Preserve. This little known gem was once a 1917 hunting lodge for Denver&apos;s famous Boettcher family. Today, there is a beautiful modern nature center with exhibits of all the animals and plant life in the area, as well as hiking trails through groves of Ponderosa pine. But for romance, wander across the road to the trail to Windy Saddle and take in one of the best mountain panoramas on the Front Range. There are views of snowcapped peaks and the foothills stretching from the plains to Wyoming. Hike Lichen Peak. Adventurous couples will enjoy a hike to Lichen Peak, which is the highest point on the top of North Table Mountain. The view, especially at sunset is unreal. To the north and west, there is a hardly a manmade thing visible. It is a wild, treeless, landscape of rock and mountains. And yet, turn to the east, and there, just a few miles away, is a gorgeous view of downtown Denver. The hike back, as stars begin to brighten in the sky, is a quality trail and a dirt road with views down into all of the twinkling lights in Golden and Clear Creek Valley. Climb Golden Cliffs. For sporty couples, what’s better than rock climbing Golden Cliffs at North Table Mountain? You can time it so that you are walking back down Table Mountain as the sun is setting. A perfect reward after your climb. If you aren’t an experienced climber, make a date with Golden Mountain Guides, a wonderful local outfitter that can help you and your Valentine reach new heights. Or simply hike the area and perhaps be inspired to try rock climbing soon. Golden Restaurants & Shops You&apos;ll Love. After you and your Valentine capture stunning view from Golden, head to town where there are plenty of dining options and shopping stops you and your Valentine will enjoy. Toast to your love of the mountains and one another at Golden Moon Speakeasy, a romantic speakeasy featuring elegant cocktails made from Golden Moon’s own handcrafted liquors. Stop into Creekside Jewelers to pick up a special surprise for your Valentine. Creekside has a wide selection of jewelry, including engagement rings, hint, hint! If you love coffee, Golden is home to a number of warm and inviting coffee houses, Café 13, the Windy Saddle, Higher Grounds. They can even put a heart in your latte! Cap your adventure with a treat. 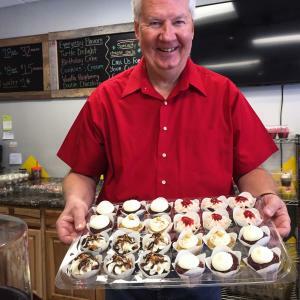 Stop into Gold Mine Cupcakes, Golden Sweets or Goozell Yogurt for a sweet with your sweetie. Start your Valentine’s Day with an adventure followed by breakfast. After an early morning outing, indulge in Elvis French Toast from Sassafrass or a savory skillet from Golden Diner. Make your Valentine’s Day Golden! And be sure to keep the spark alive all year long by following us on Facebook, Instagram and Twitter and visiting VisitGolden.com for date ideas throughout the year!